I love how responsive everyone is at Tamarack. From Terry to Felicia and the Division Heads – it’s clear that it’s a priority and I very much appreciate that. (Our son) is having a great summer. He has more confidence and now loves trying new things. Our Parent Visiting Day visit was very meaningful and informative. We saw how much our son was enjoying all the activities and found out exactly why he talks about Tamarack and his counselors all the time! All three of his counselors were amazing! They were fully focused on the kids the whole time and showed great leadership skills. We are so very happy with the experience (our son) is having!!! He is happy and hungry and tired when he gets home — which is wonderful! He loves his Division Head and counselors, as well as the staff on his bus rides! We LOVE all of the photo updates and weekly written updates we get from camp as it allows us to open up the conversation with (our son) about what’s going on, as we usually get so little out of him each day! He has grown so much in just the last few weeks and is getting so comfortable with water and swimming, which is so important to us! Love the team spirit exhibited by all of your employees. It’s contagious! Expertise of counselors is great. I love that my child has the opportunity to try so many new activities in such a positive atmosphere!!!!! Kids loved it! My 8yr old had a horrible experience at camp when she was 4 and for the last 4 years we’ve been trying to find a camp that she would fully enjoy; finally we found Tamarack! My 4yr old joined her sister and she loved it too! They have plenty of activities so that the kids are never bored. The staff are ultra-attentive as well as the counselors. We will definitely be going back next year! Every day is an adventure! Kids learn to test themselves and work towards reaching a goal. Whether it’s achieving a personal best in one of the many athletic endeavors (swimming, skateboarding, mountain biking, climbing wall, boating), or creating a masterpiece in one of the many creative arts programs (cooking, video, arts and crafts, dance), Tamarack has been a life enhancing experience for my three children. We are all looking forward to another great summer at Tamarack! We were charmed by camp director Terry and impressed by Tamarack’s brand new facilities. The clincher was how they talk about camp as a place to grow and learn to be a better person in a way that is not really taught in school. We worried our son might resist a full day with a lot of sports in the mix, but the staff were nothing but encouraging and supportive — he loved it and he can’t wait to return this summer. Highlights for him included ropes course, canoeing, filmmaking and of course Gaga. It is smaller and less flashy than some other camps in the area, but that’s what we love about it. Tamarack is a beautiful place for kids to be. Aesthetically, it nestled near & in the woods, giving campers the real camp feel. The staff are always friendly and welcoming – even when they have to help load kids in cars at dismissal during a summer deluge! Best of all Tamarack challenges campers in a way that boosts self-esteem. Makes me want to be a kid again. Tamarack is a fabulous camp! My daughter has gone there the past two summers and had an amazing time. The facilities are brand new, the pools are beautiful, and the camp makes full use of the grounds and the lake. Highly recommended! From the first day it opened Tamarack Day Camp proved to be the place to spend summer. Every day the kids enjoyed outdoor camp activities like canoeing, fishing, zip lining and swimming. They enjoyed doing crafts, learning a new sport or just hanging out and laughing with their friends. Tamarack really has that summer camp feel in its’ wooded setting in Randolph and my girls loved being a part of the Tamarack family. The staff is phenomenal, accessible and friendly. 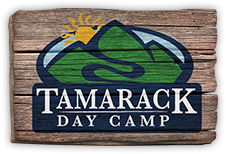 We highly recommend Tamarack Day Camp! My boys had the most amazing summer at Tamarack! The staff was amazing, and my kids came home every day exhausted and happy. We can’t wait until next summer! My kids had a great summer at Tamarack. Between the skateboarding, video editing, lacrosse, soccer, swimming, the zipline—they don’t have just one favorite activity.